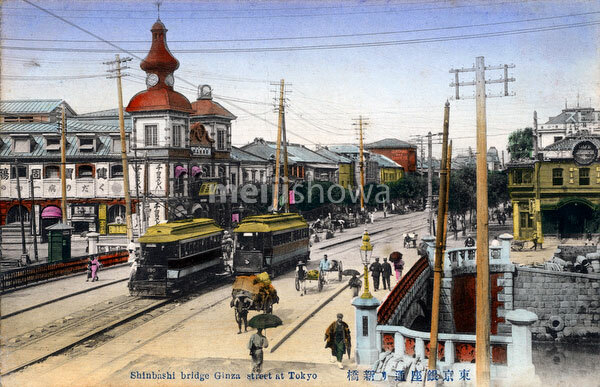 A streetcar crosses the Shinbashi (also Shimbashi) bridge while another enters Ginza avenue in Tokyo. The building with the clock tower is the Teikoku Hakuhin-kan Kankoba (current Hakuhinkan). Established in October 1899 (Meiji 32), it was a prototype department store. See 71005-0004 – Shinbashi Bridge Ginza for an earlier photo of this location.